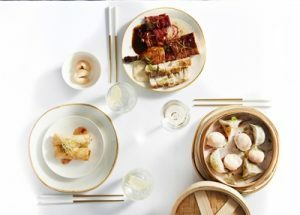 Global Travel Media » Blog Archive » JOHN ROZENTALS enjoys the best Chinese banquet he’s ever had, and renews acquaintance with a favourite hotel just across Broadway. 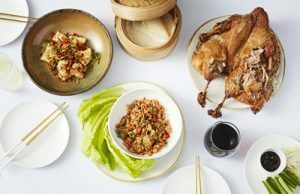 JOHN ROZENTALS enjoys the best Chinese banquet he’s ever had, and renews acquaintance with a favourite hotel just across Broadway. I’ve just had the best Chinese banquet that I’ve ever had in my life. Truly. And consider, I’ve eaten in Beijing, Shanghai and San Francisco’s Chinatown, and have been a regular consumer of Australian Chinese food for just on 50 years. Indeed, I can remember days when Sydney’s Glebe Point Road only had two restaurants — the top Chinese and the bottom Chinese, though neither of these would throw out much of a challenge in this quest. 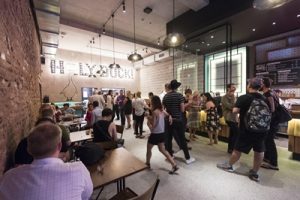 It happened at the Holy Duck, one of the dining establishments that have taken by storm the new-look redevelopment of Sydney’s inner-western suburb of Chippendale, an old area next to the city’s Central Station. Metro Aspire’s restaurant … it needn’t cost a fortune to beautify a space. For at least most of the past century-and-a-half Chippendale was largely a mix of working-class and student accommodation, with a bit of light industry thrown in. At its Central Railway end, Chippendale was absolutely dominated by the Kensington Brewery, whose initials provided the name for Tooth’s most popular beer, though its sweetness led to suggestions the label could just as easily refer to “kids’ beer”. 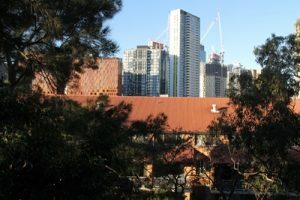 The brewery is still a key ingredient of the suburb, but these days in the form of the Central Park redevelopment, which houses the completely revamped Old Clare Hotel, a myriad of accommodation options, a vast platter of restaurants and many artistic endeavours. Metro Aspire … a quiet green location close to Sydney’s CBD. Many of the suburb’s old houses have emerged as trendy accommodation but many have been transformed into the edgiest of art spaces, which on their own form the basis for rewarding tourist visits. 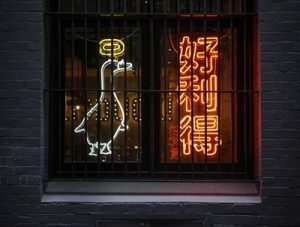 Anyway, back to Holy Duck, located right in the suburb’s vibrant new heart, Kensington Street. It’s brash and noisy and hectic, like any number of good modern Chinese restaurants in Australia. The difference comes in the food, which is a couple of cuts above anything else and provides a veritable explosion of flavours and textures. Holy Duck … looks like any other busy Australian Chinese, but the food sets it apart. Maitre’d Simon breaks up the duck in spectacular fashion, and eating it is a sublime, hands-on experience, wrapping tender morsels of meat, smothered in sauce, together with expertly slivered cucumber and shallots, inside packets of delight. Holy Duck’s signature crispy duck … a sublime hands-on experience. It rivals the very best duck that I tasted in the dish’s city of origin — Beijing. I’m overwhelmed by Simon’s generosity and hospitality, or at least my chopsticks are, as I’m served a taste of about a dozen dishes, such as stir-fried seasonal vegetables, a delicious combination of snow peas, baby corn and asparagus, and the specialty platter, a beautifully presented combination of roast duck, barbecued char siu and pork belly — a heavenly trio with a selection of individually assigned sauces. Picking a highlight iss impossible in such a stellar line-up, but my mind keeps wandering back to the very first dish I’d tried — delicate little steamed dumplings made from duck and pork. They set the tone for everything else. A selection of Holy Duck entrées. If there was a weakness it was kept until the very last — a dish of black-sesame-egg-and-spinach tufu. Perhaps it’s an acquired taste but the texture — or rather lack of it — just didn’t do it for me. Still, I had the dumplings to think about as I made my way back to the hotel, though it wasn’t a long trip actually. I was staying at a regular favourite, the Metro Aspire, just across Broadway in Ultimo. I really like it. 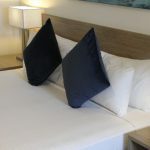 It’s reasonably priced, it’s comfortable, it’s tucked away in a quiet, very green corner, and it’s close to the city, close enough to be walking distance from Central Station. Holy Duck — an unlikely façade for top-grade Chinese cuisine. 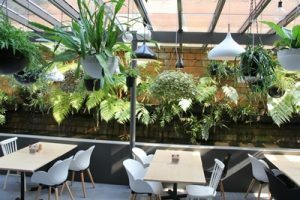 Its restaurant and lounge provide an object lesson in how to cleverly redecorate a space without the project costing the earth. I’ll even forgive the Aspire’s location straight across Bulwarra Road from where I slaved many years ago, in student days, at what was then the NSW Bottle Company, repacking used beer bottles which were delivered, more often than not, just up the road to Tooth’s Kensington Brewery in Chippendale.